In Dutch oven or large saucepan, heat oil over medium-high heat. Add celery, carrots and onion; cook, stirring frequently, until tender. Stir in chicken, pepper and 6 cups broth. Heat to boiling. Reduce heat to medium-low; simmer 15 minutes. Meanwhile, place flour in medium bowl. Cut in shortening, using pastry blender (or pulling 2 table knives through ingredients in opposite directions), until mixture resembles coarse crumbs. Stir in parsley. Add 1/2 cup broth; stir just until dry ingredients are moistened. 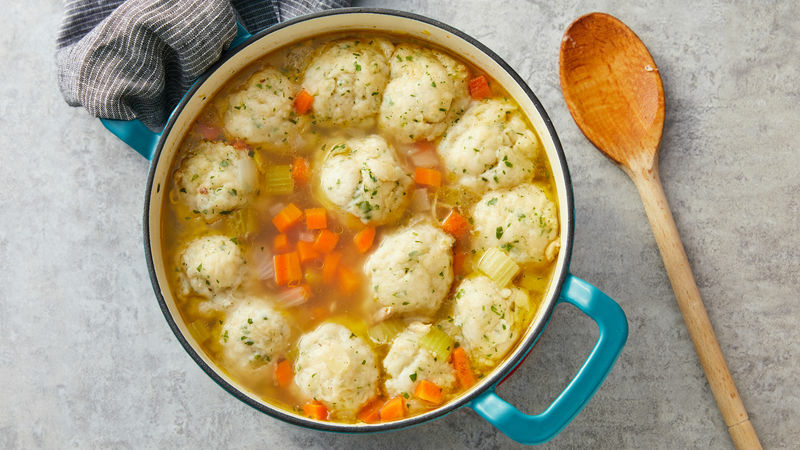 Drop dough by tablespoonfuls onto chicken or vegetables in simmering stew. Cover; cook over medium-low heat 10 to 15 minutes or until dumplings are firm. Use rotisserie chicken from your supermarket to save time.